Zhan was pigging out in the restaurant of his choice, eating all he could, and running up quite the bill. He was on his third bowl of rice, shoving it down his throat faster than most people could, or at least, faster than people with manners did. As he polished off this bowl, he looked to the waiter. "I want more beef tempura, please!!" He called out. The waiter nodded, obviously not sure whether he was happy to be getting so much business, or angry at Zhan's disrespect. Zhan sat for a bit, waiting for his tempura. "Hmm..." He muttered. 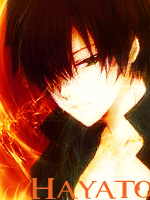 Zhan looked deep in thought, like he was in one of his rare moments of proper Symbol-like conduct. "I think that last bit of rice was overcooked....." He finished. Hayato was wandering around the town, he was looking around the town, it was so peaceful and quiet. Then all of a sudden, his stomach grumbled. "Of course that happens while I'm enjoying myself." Hayato said to himself. Hayato let his arms hang in his sleeves, which were a bit shorter than the sleeves. Hayato walked towards the restaraunt, stomach still grumbling. Hayato was jingling around with his wallet in his pocket under his chest. Hayato walked into the restaraunt and seen a great feat. His jaw dropped as he seen some guy wolfing down food left and right. Hayato walked towards the table where the guy was eating the food. As he got closer, he see the mark of a symbol and easily knew this was a strong guy. "Mind if I sit here?" Hayato said as he approached the table. Hayato wanted to train but that could wait later. Zhan looked over to the newcomer who approached him. "Nah, I don't mind. As long as you don't try to steal my food!" He laughed. As he finished saying so the water brought his tempura. Before taking a bite, he smiled at the newcomer. "My name is Zhandouji Heping by the way, I'm the Symbol called 'the Yellow Dragon'. Who are you?" He asked. Almost immediately after asking, he picked up his chopsticks again, and began shoveling food down his throat. The last statement barely qualifies as a hyperbole...barely. This tempura is really good!! He thought, without losing any pace in his eating. Hayato sat down laughed with him. He then turned to the waiter and said "Can you bring me a big bowl of ramen , please? Anything would do." The waiter bowed and turned. Hayato then turned towards the symbol who said his name was Zhandouji, the Yellow Dragon. Hayato then said "My name is Hayato Honoo. I guess you can say I'm one of the best fighters and swordsmen you will ever meet. Hayato had a smile on his face as he said this. Hayato's stomach grumbled as he watched the symbol eat. Hayato smelled the food in the restaraunt and became even hungrier. Finally the waiter brought his food. "Thank you, sir." Hayato said as he gave a slight bow towards the waiter. He picked up some chopsticks and started eating, but slowly. He was making sure to taste everything in the ramen. Zhao was hungry so he looked for a restaurant where he can eat peacefully. Then he saw a restaurant with many people. "Here's a restaurant that I can eat and relax." He said. So he went to the restaurant. He saw two guys talking to each other. He saw a symbol on the first guy. This guy has a symbol like mine. Maybe he is like me too. He thought. He went to them. "May I sit here and eat?" He asked while smiling to them. While he is smiling he stared on the guy with a symbol wandering if he too is like him. Zhan nodded, this time, his mouth too full to speak. After a few moments later he finished the tempura, and sat down his chopsticks. "Good..."He muttered. "Nice to meet you Hayato!" He said to the first one. Then he turned to the other. "Anyway, I'm Zhandouji Heping, the Yellow Dragon! Nice to meet you!" He said with a broad smile. Zhandouji looked over for the waiter. "Um.... more rice!" He announced. The waiter nodded, and walked off to the kitchen. So, that Hayato guy is a swordsman? I wonder how strong he is... Zhan wondered, picking small bits of rice from his bowl to eat, as he sat awaiting his food. "Oww. I'm Zhao Yun, the Black Tortoise. Nice to meet you too." He said while he is smiling. Then he asked to the other one and said "And what's your name?" After asking he sat down and called the waiter to order food. "Waiter!" He shouted. "I want to eat a Chicken Teriyaki and 5 pieces of a tempura with sauce." He said with a smile on his face. Hayato seen the newcomer and said "Well, my name is Hayato Honoo. Nice to meet you." Hayato looked at the two and realized that he was sitting with two symbols. Hayato finished his bowl with a smile and waited for the waiter to come so he can get more. "Zhao, Zhandouji." Hayato said as he looked at them both, "You both do know that you guys are both symbols, right? Hayato continued sarcastically. He laughed a little to himself. He looked back and saw the waiter coming with Zhao's order. "Well, nice to meet you two." He said to them happily. Then he's stomach begun to grumble. He called the waiter again. "Waiter! Where is my order?" He shouted. The again, his stomach grumbled. "Zhao, Zhandouji." Hayato said to them. "Yes?" He said looking curios why he called them. "You both do know that you guys are both symbols, right?" Hayato said. "Yes, I know that I'm a symbol. I knew it when my uncle tell me that I am a symbol." He answered. Then Zhao looked at he's order.He saw that the waiter is coming for he's order to be served. Zhan was mostly ignoring the other two now. He wasn't trying to be rude, but he was into his food. After he finished it he smiled. "I think that'll be enough food for now!" He said with a smile. "Mr. Waiter, bring me my bill, 'kay?" He added. The waiter nodded, and retrieved the bill, bringing it over to them. "Ooh....that's.... a lot of money." Zhan muttered, pulling out his money. He left the amount listed, and turned to the two who had joined his table. "So, you're a turtle?" He finally said to Zhao. "That's cool."